(CNN) – The liberal group MoveOn.org will run a thirty-second television spot in battleground states mocking Rafalca, the dressage horse competing at the London Olympics that is co-owned by Ann Romney. The group said the total buy amounted to five figures, which will be used to air the ad in Nevada, Ohio and Pennsylvania. The ad is told from the perspective of the horse. "My name's Rafalca, the Romney's dressage horse," the ad begins. MoveOn.org uses a poorly-executed English accent as the voice of the Romney's horse. "You might have seen me execute 'leg yields' and 'flying changes,'" the ad continues, using terms from the sport of dressage. "How do I pull off such grace and athleticism while looking so good? Maybe it's because the Romneys spend $77,000 per year on my upkeep." The ad comes to a grim conclusion, stating: "After Mitt Romney repeals health care and ships your jobs overseas, I daresay your life won't be nearly as pampered as mine. After all, you're not one of his horses." In a statement, MoveOn.org's executive director said the group wasn't lampooning the Romney's care of their horse – just the expense of it. "There's nothing wrong with taking good care of a horse, but there's something messed up about a millionaire who spends twice what most Americans make in a year caring for a horse, but wants to take away people's health care and offshore their jobs," Justin Ruben wrote. "We're rooting for Rafalca and all of our Olympians to bring home the gold, but we're sure not rooting for Mitt Romney to send jobs overseas. Voters had best steer clear of Romney unless they're looking for a ride on a one-trick trickle down pony." 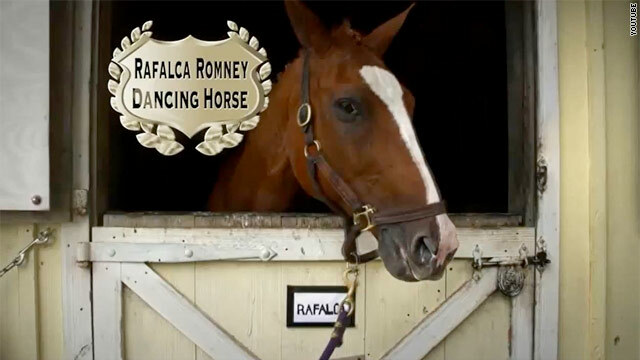 In mid-July, the Democratic National Committee briefly used video of the Romney's Olympic-bound horse to portray the candidate as "dancing around the issues," but later discontinued using Rafalca because it could be seen as offensive to the GOP candidate's wife. Ann Romney began riding horses when she was diagnosed with multiple sclerosis in 1998, and has said the sport has helped lessen the symptoms of the inflammatory disease. CNN's Kevin Liptak and Paul Steinhauser contributed to this report. And the Repubs. don't see the problem with this picture...Political ideology on the level with religious beliefs. No wonder all of the Great Thinkers of Western Civilization were constantly battling Organized Religion; it hinders the thought process. So many of you lemmings are concerned about the rich paying "their fair share." I am concerned about the 52 percent of low and middle-earning US Citizens who pay no taxes. When I was a teen and lived at home, my father reminded me frequently that as long as he paid the bills, he called the shots. I feel that way today – those who pay for 92% of the taxes (the top 20% of earners) should get to call the shots. This is why our country was founded as a republic and not a democracy! Democracy is essentially "mob rule." 77k to compete that horse? Gotta be kidding me. It's at least 500k, and year after year after year. The Olympics is hardly her 'debut'. She's been competing at that level (and that monthly price tag) for a LONG TIME. John said: "those who pay for 92% of the taxes (the top 20% of earners) should get to call the shots." The point is, they DO call the shots. They specify legislation that benefits themselves. Why do you think so many people are stuck permanently in the bottom of society? It's because the rich guy calls the shots. There is no way for those folks to move up. They are squeezed by the rich into the cellar. America is dog-eat-dog, and the big dogs have had a feast on the middle and lower classes. Implicit in your might-makes-right argument is that the rich somehow deserve their riches. Therefore, you must believe that the leader of North Korea and all the other despots of this world deserve their positions. It's the same logic. A cursory examination of the historical truth shows clearly that people generally get to the top by inheriting or by doing something that is anti-social and should be criminal. This country needs a new set of values whereby we as a society take care of each other rather than allowing greed to run rampant. It needs what Christians traditionally have valued but what they now seem to ignore completely. If you advocate might-makes-right, you do not have a traditional American set of morals. "When I was a teen and lived at home, my father reminded me frequently that as long as he paid the bills, he called the shots. I feel that way today – those who pay for 92% of the taxes (the top 20% of earners) should get to call the shots. This is why our country was founded as a republic and not a democracy! Democracy is essentially "mob rule."" Wow. That's really illuminating. What fantastic examples of conservative hubris AND the failure of our education system you are. Given the choice between running on the Democrats' record in the six years they've been in power, or attacking the challenger's horse, I think they've made a wise political decision. They should have talked about Super Hit. Hmmm.... All you republican turn animal activist over night. Super Hit. Super Hit. Never heard of him? Seamus. These people dont know the difference between lifestock and pets yet want tax breaks for stuff that they CAN AFFORD. Shame on anybody that defends willard romney.